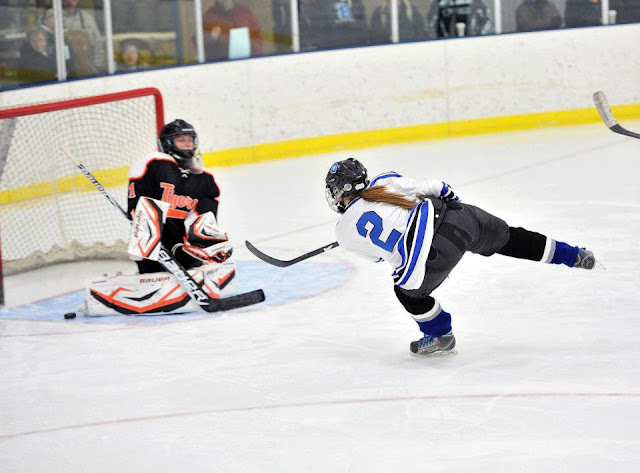 The cousin scoring a goal in a tournament game. I didn't take the photo, I got it off her Facebook page. It was a pretty great sports weekend for me. The Packers won their playoff game against the rival Vikings, I was able to watch a great high school girls hockey game (with my cousin's team winning) and it sounds like there will be a NHL season after all this year. This time last week, things were a little rough. Not only did my beloved Packers lost their final regular season game against the Vikings, but they would meet again the next Saturday night at 7:00pm CST. The fact that the two teams were to play again wasn't the bad part. It would be awesome to see the two rivals meet up again. The problem was a scheduling conflict for me. I have a cousin playing her final year of high school hockey. Since she was little, I've made an effort to see as many of her (and her older sister when she played) games as possible. Now that she's a Senior and it's her final year of playing locally, I make a point not to miss a home game if at all possible. Next year the cousin will be playing Division III College hockey and it will be quite a drive to see one of her games; so I don't think I'll see more than one or two. Of course with my luck, guess who else had a game scheduled for Saturday night at 7:00pm CST. It only took a few minutes to decide that I was going to miss the Packer game. Sorry Pack, family comes first. Besides, the way I saw it, I would be able to see the Pack in the next playoff game. Plus if they lost again to the Vikings, I'd be pissed I missed the cousin's game. Then during the week, I got the best news. The schedule I has was wrong; my cousin's game started at 5:00pm! With the games usually running about two hours, that left me with just enough time to leave the rink and go to one of my favorite local establishments to watch the game with friends! All was right with the world again once again. Of course it couldn't go perfectly. The game before my cousin's ran late. No problem, I thought, that just meant I might miss a few minutes of the first quarter. But I decided if the game became a blowout, I'd sneak out early. The cousin would understand. Not only it was a close game, it went into overtime. With a minute left to play, with a one goal lead, my cousin had a nice breakaway with a chance to increase the lead and seal up the victory. Instead of scoring, she had the puck taken away from her at the last second. In her frustration, she slashed at the other team's player with her stick. The referee saw it and with my cousin in the penalty box, the other team scored a power play goal and put the game into overtime. The cousin's team won the game about five minutes into the overtime period. I was able to meet up with my friends just in time for the second quarter. Not quite perfect timing, but good enough for me. Both teams I wanted to see win did and I got to spend quality time with friends and family. Life is good.